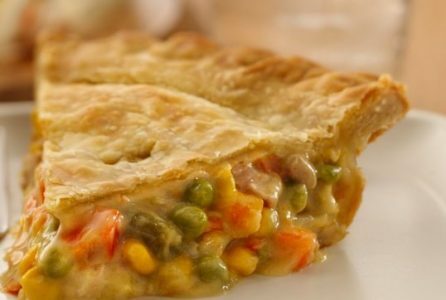 The delights of classic chicken pot pie are many, from the burnished, flaky crust to the luscious, savory filling. 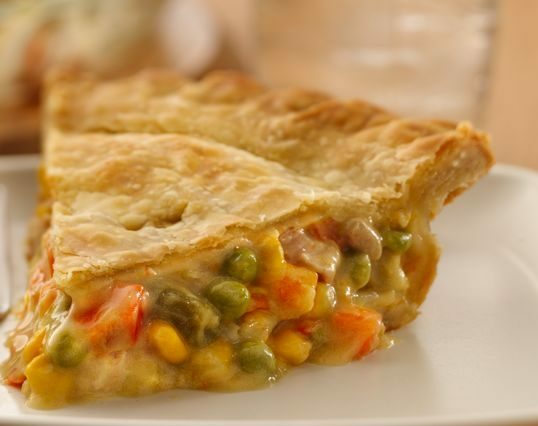 The delights of classic chicken pot pie are many — from the burnished, flaky crust to the luscious, savory filling. Boneless, skinless chicken thighs, cut into pieces, were easy to work with and stayed moist through cooking. While tasters liked the deeper flavor provided by browning the chicken, they weren’t keen on the crusty, browned exterior on the pieces — it didn’t jive with the luxurious, creamy filling. Instead, we simply stirred bite-size pieces of chicken right into the gravy and turned to two powerhouse ingredients — tomato paste and soy sauce — to boost savoriness without being distinguishable in their own right. To give our pot pie fresh spring flavor we swapped in leeks for onions and stirred in some fresh asparagus, peas, and tarragon after pulling the pot from the oven. With our one-pot filling perfected, we turned to the crust. Instead of labor-intensive home-made pastry, we decided to use buttery store-bought puff pastry and wove it into a simple but stunning lattice. But no matter what we tried, baking the crust on top of the filling inevitably led to sorry, soggy results. Cut sheet of parchment paper to match outline of Dutch oven lid and place on large plate or upturned rimmed baking sheet. Roll puff pastry sheet into 15-by-11-inch rectangle on lightly floured counter. Using pizza cutter or sharp knife, cut pastry widthwise into ten 1 1/2 inch-wide strips. Space 5 pastry strips parallel and evenly across -parchment circle. Fold back first, third, and fifth strips almost completely. Lay additional pastry strip perpendicular to second and fourth strips, keeping it snug to folded edges of pastry, then unfold strips. Repeat laying remaining 4 pastry strips evenly across parchment circle, alternating between folding back second and fourth strips and first, third, and fifth strips to create lattice pattern. Using pizza cutter, trim edges of pastry following outline of parchment circle. Cover loosely with plastic wrap and refrigerate while preparing filling. Adjust oven rack to lower-middle position and heat oven to 400 F. Melt butter in Dutch oven over medium heat. Add leeks, carrots, and 1 teaspoon salt and cook until vegetables are softened, about 5 minutes. Stir in flour, garlic, and tomato paste and cook for 1 minute. Slowly stir in broth, scraping up any browned bits and smoothing out any lumps. Stir in cream, soy sauce, and bay leaves. Bring to simmer and cook until mixture is thickened, about 3 minutes. Stir in chicken and return to simmer. Off heat, cover pot with inverted lid and carefully place parchment with pastry on lid. Brush pastry with egg and sprinkle with salt. Transfer pot to oven and bake until pastry is puffed and golden brown, 25 to 30 minutes, rotating pot halfway through baking. Remove pot from oven. Transfer parchment with pastry to wire rack; discard parchment. Remove lid and discard bay leaves. Stir asparagus into filling and cook over medium heat until crisp-tender, 3 to 5 minutes. Off heat, stir in peas and let sit until heated through, about 5 minutes. Adjust filling consistency with extra hot broth as needed. Stir in tarragon and lemon zest and juice. Season with salt and pepper to taste. Set pastry on top of filling and serve.